Original handcrafted bunny to adorn your walls. 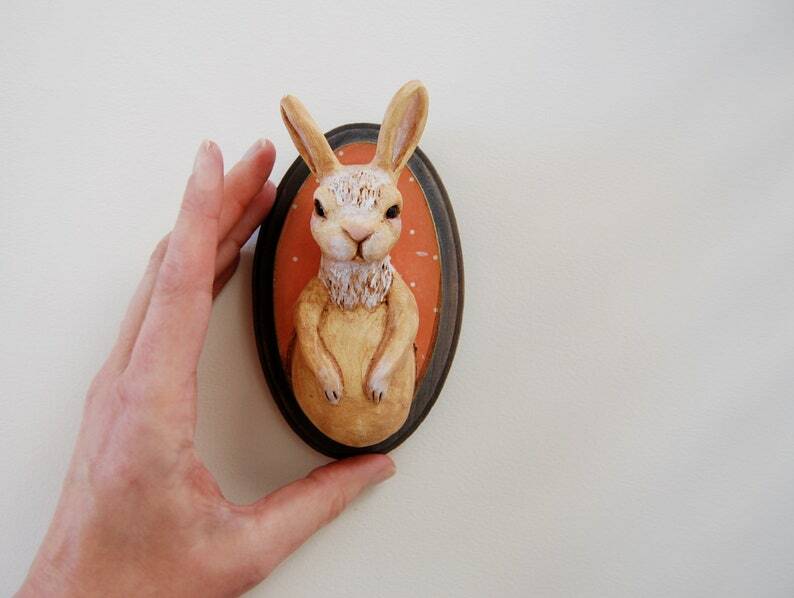 I created this little rabbit figurine with multiple layers of air dry paper clay. After days of drying, I painted her with layers of creamy golden beige with hints of white and pink. I then add layers of varnish She is mounted to a small wooden plaque perfect for hanging! She is a one-of-a-kind unique gift for yourself or rabbit fan. Art meant for display purposes, not suitable for children. Display away from water, moisture, and direct sunlight. All of my sculptures are sculpted and hand painted by me. I reserve the right to create duplicates, multiple variations, or similar works but due to the handmade nature, each will be unique and original. All of my artwork is packaged carefully and mailed via USPS with a tracking number.